Safaricom has today released its FY 2015/16 financial results posting a 19% increase in profit from 31 billion to 38 Billion. The company attributed the growth to new users who helped push revenue growth across all segments. The company’s total revenue rose to 195.68 Billion, a 20% increase from a similar period last year. The company saw its market share stand at 64.7% down from 67% as per a Communications Authority report. Voice revenue contributed 46% of the company’s total revenues with a 3.9% growth. Voice contributed 90.85 Billion of the company’s revenues with customers growing by 7.8%. Interestingly, top ups for airtime via M-Pesa contributed 42.3% of the all airtime purchases. Okoa Jahazi top ups also increased 22.9%. Non-voice services such as M-pesa and Data also witnessing massive growth. M-Pesa contributed nearly 50% of the non-voice revenue with the service growing its 30-day active users to 16.6 Million. The service generated Kshs. 45 Billion in revenues with transactions totaling 5 Trillion performed through the platform. The firm attributed the robust growth to the emergence of new segment such as sports betting. In 2015, the company relocated M-Pesa servers from Germany which, led to improvement in transaction times, with the company stating no service outages have been experienced since October 2015. The firm also highlighted the steady growth of international mobile money transfer services which grew 64% to 13.1 Billion. 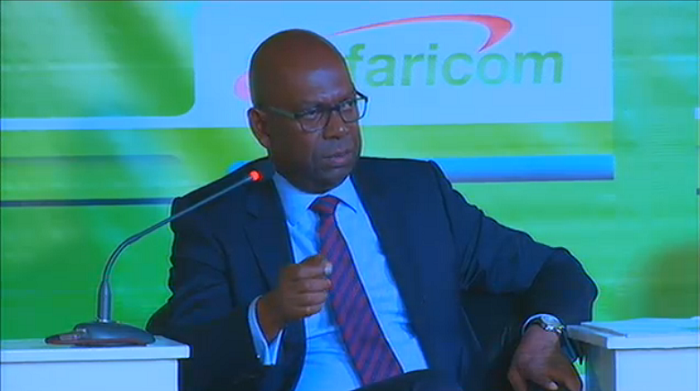 Credit facilities using M-Pesa such as M-Shwari in partnership with CBA and KCB and M-Pesa witnessed growth. 30-day active users on M-Shwari grew to 3.9 Million with 8.1 Billion in deposits and 7 Billion in loans as March 31st. The non-performing loans for the service stood at 1.93%. KCB M-Pesa 30 day active customers stood 730,000 with deposits 190 Million and loans at 1.47 Billion. M-Pesa agents grew to 100,000. Mobile data grew 42.7% attributed to 128% growth in smartphones to 7.8 Million users. The company’s 30-day active mobile data users grew to 14 Million representing 53% of the company’s customer base. The firm also saw a 77% increase in mobile data usage per customers. The firm has been keen to spread its 4G LTE network across the country which now stands at 467 sites in 20 counties. The company further announced that 3G coverage stood at 78% with addition of 1,000 3G sites across the county.